In medium bowl, mix 1/3 cup of the yogurt, the paprika and chicken. Set aside. In another medium bowl, mix remaining yogurt and the coleslaw mix. In 1-quart saucepan, heat 1 tablespoon of the oil over medium-low heat. Add 1 to 2 teaspoons of the cumin seed. Cook and stir a few seconds; remove from heat, stir into the coleslaw mixture. Stir in 1/2 teaspoon salt and 1/4 teaspoon pepper. Set aside. In 12-inch nonstick skillet, heat 1 1/2 tablespoons of the oil over medium heat. Separate dough into 8 biscuits. Place 2 biscuits on waxed paper; flatten slightly. Sprinkle each with 1/4 teaspoon of the remaining cumin seed. Cover with waxed paper; roll each biscuit into 5 1/2 to 6-inch round. Add 2 biscuit rounds to skillet; cook 1 minute on each side or until golden brown and no longer doughy. Place in foil to keep warm. Repeat with remaining oil and biscuit rounds. Wipe out skillet; heat over medium heat. Add chicken mixture; cook 3 to 5 minutes or until thoroughly heated, stirring frequently. 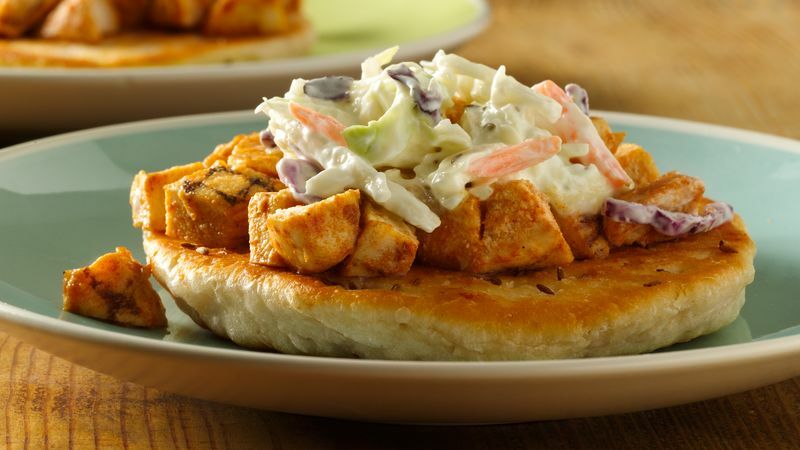 Top biscuit rounds with chicken mixture and coleslaw.